A new federal law would halt welfare benefit withdrawals at casinos, strip clubs. Thousands of dollars intended to help needy New Yorkers buy basic necessities like food, shelter, and clothes are being extracted from ATMs in popular vacation spots, including Hawaii, Florida, and Las Vegas, a News 4 I-Team investigation found. The I-Team analyzed more than seven million ATM withdrawals where cash was obtained using Electronic Benefits Transfer, or EBT, cards from January 2010 through November 2011. The cards are used to access traditional food stamp benefits along with other cash welfare benefits. Those cash benefits can be extracted by putting the EBT card into an ATM. 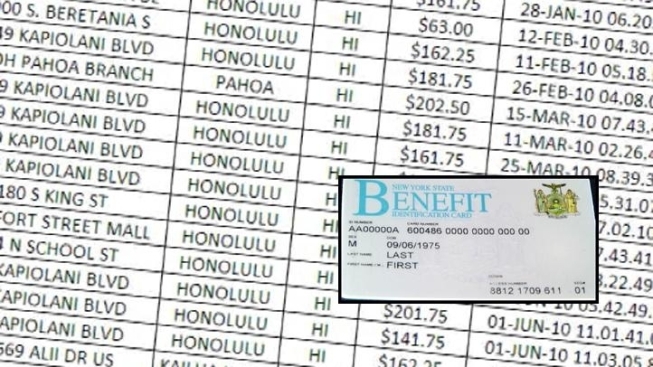 The News 4 analysis found more than $6,600 withdrawn in Hawaii, including at a resort in Waikiki. There have also been withdrawals from ATMs in the Florida Keys, around Disney World and the Daytona International Speedway. In all, the I-Team analysis showed more than $8.9 million removed from ATMs outside of New York or any of its border states. That includes nearly $200,000 withdrawn throughout California and more than $34,000 in Las Vegas – some in casinos. The state Office of Temporary and Disability Assistance did not officially comment, but said the amount withdrawn in casinos, liquor stores and strip clubs is minuscule – less than 1 percent -- compared to the more than $5 billion handed out annually. And, a spokesman pointed out, a majority of welfare recipients use the cards as intended. The information comes as Congress has passed – and the president has promised to sign -- the payroll tax cut bill, which includes a ban on welfare ATM withdrawals at casinos, liquor stores and strip clubs. “We’re giving people taxpayer dollars so that they can live and exist. We want them to have it, we just want them to spend it correctly, fairly and honestly,” said State Sen. Marty Golden, a Republican of Bay Ridge. Joel Berg, executive director of the New York City Coalition Against Hunger, said there is no evidence that extracting cash in a vacation destination means a welfare recipient is doing anything wrong. He said lots of needy New Yorkers must travel far distances for low income jobs.